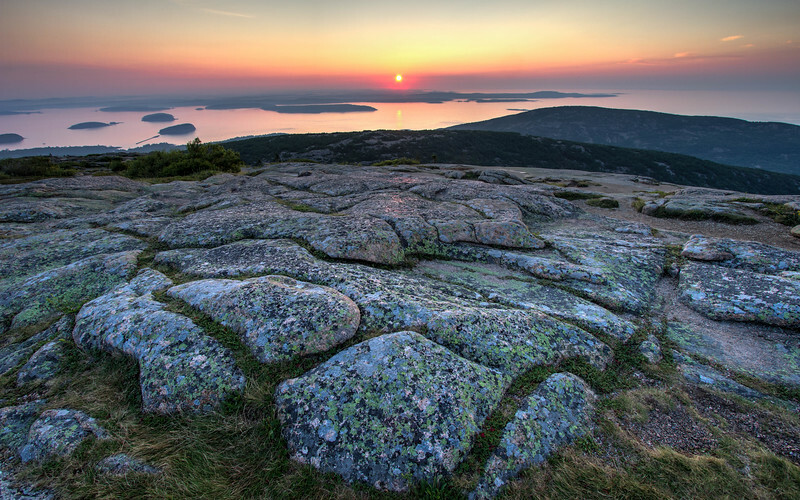 Cadillac Mountion is a popular destination in Acadia National Park, even in the early morning hours as many want to catch the first sunrise in the U.S. (however, this is true only in the fall and winter when the sun rises south of due east). In the foreground is granite rock that permeates the mountain. According to a nearby sign, the rock is "...granite rock formed millions of years ago when a very hot liquit cooled deep below the Earth's surface. Trapped in a magma chamber more than two miles deep, the 1,652 degree F (900 degrees C) liquid crystallized into the mineral-rich, pink Cadillac Mountain granite. Eventually erosion and glaciers scoured and removed the softer, overllying rock, revealing the harder, more resistant granite-Acadia's mountains." This photo is a composite of three exposures of varying durations, shot with a Canon T2i, 10-22 mm lens at 10 mm (16 mm with 1.6 crop factor very low to the ground. Cadillac Mountain is within Acadia National Park with an elevation of about 1,500 feet, according to Wikipedia. The mountain honors the French explorer and adventurer, Antoine Laumet de La Mothe, sieur de Cadillac. He explored New France, an area of North America that stretched from present-day Eastern Canada in the north to Louisiana on the Gulf of Mexico in the south. He helped found Detroit; founders of the Cadillac auto company paid homage to him by using his name for their company and his armorial bearings as its logo in 1902.